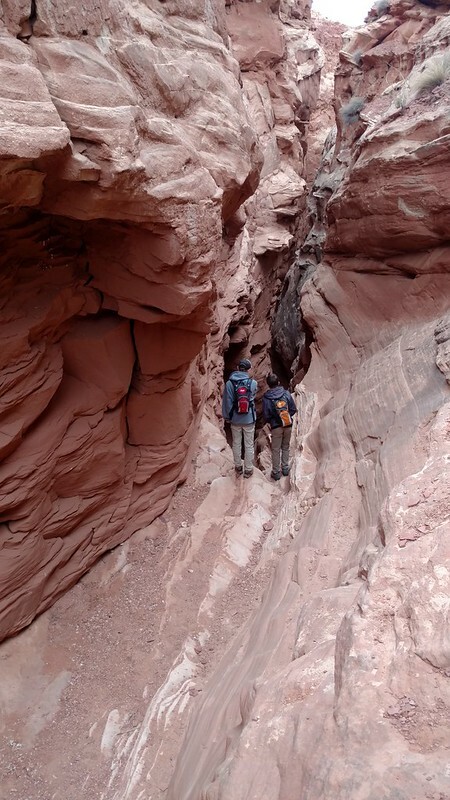 Ever since hearing of Aron Ralston and his hike down this canyon where he became trapped by a dislodged boulder for 127 hours only to escape by cutting off his own arm with a dull multi-tool we've known we had to do this hike. Thirteen years later we finally did. 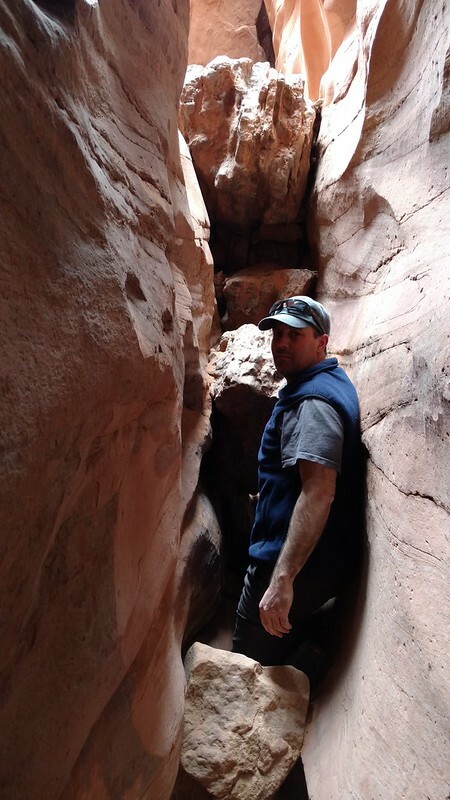 I am unsure of the route Ralston originally took to get to the actual Blue John Slot canyon, but we ultimately decided to hike down the west fork. 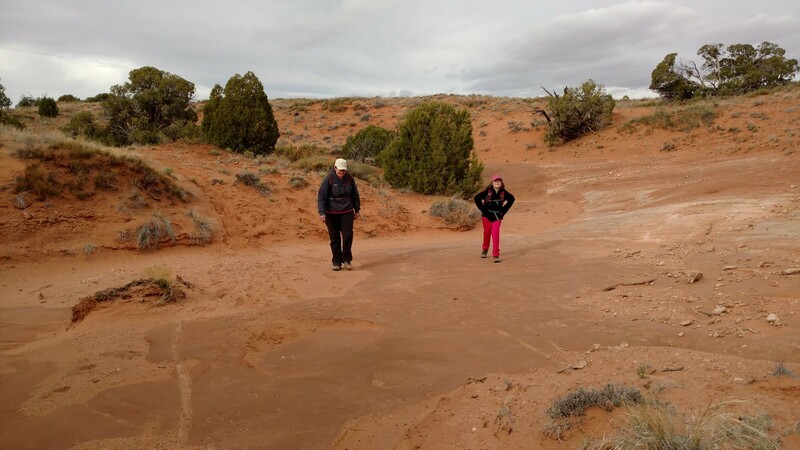 Our original plan was to hike down Little Blue John Canyon, but because of cooler temperatures and the possibility of pools of water we opted for the likely drier route. Little Blue John Requires two rappels while the west fork does not. 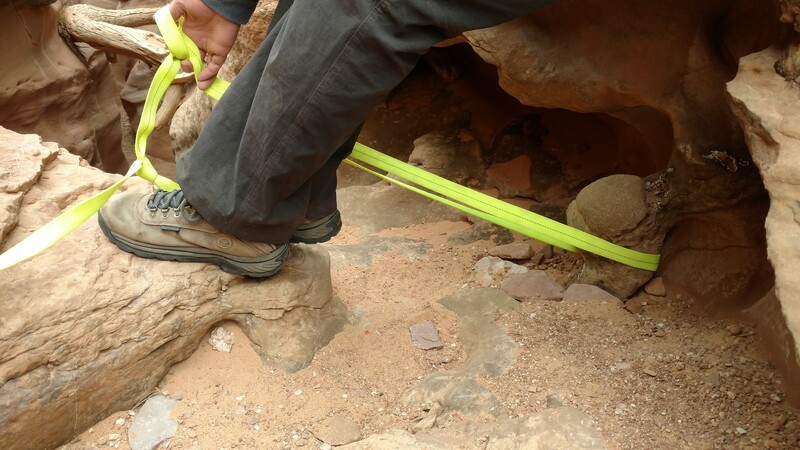 This let us leave our climbing gear and rope at camp and have a more leisurely hike with the family. 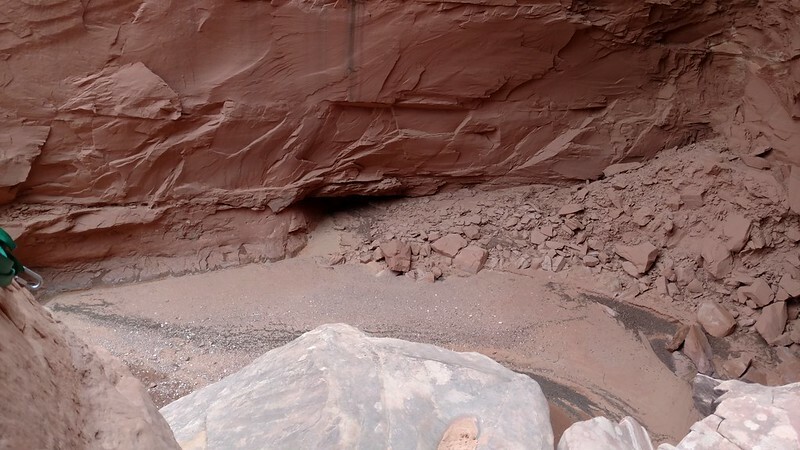 The west fork still has some impressive slots and some downclimbing is required. Even though this is an easier route, it is not an easy hike and still requires skill and a good part of the day to complete. 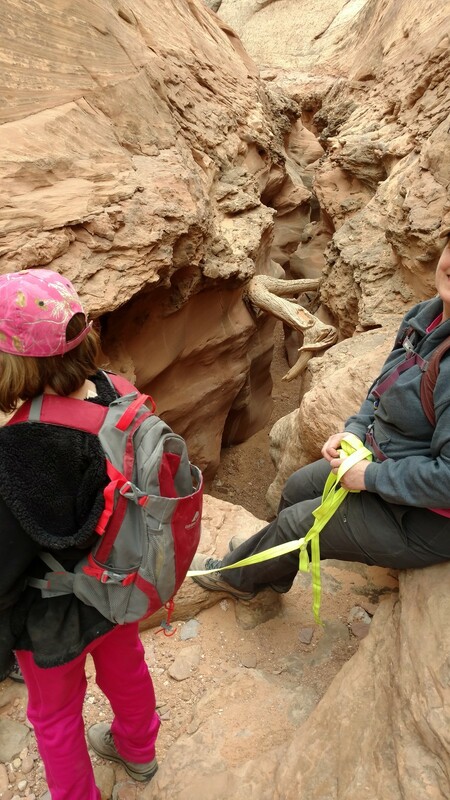 It is a very good idea to go with at least one other person and take some webbing on this hike. We used webbing and a web ladder in one spot, although it could be done without as my son proved. Climbing skill also comes in handy to ascend some of the slots on the way back. Flash floods would be a great danger here as well, so keep an eye on the sky and don't go here if rain is in the forecast. We did this hike during our last trip to Caineville and is a great way to spend a day away from the bikes. It's also very near to the San Rafael riding area. Continuing down the wash. The sand is not that deep and hiking is relatively easy. This part of the West Fork is a little intimidating. We were able to down climb this section with care. The boys made it look pretty easy. Once down this the hike to the main wash is easy. Just above this is an optional rappel with anchors. It would have been a fun easy rappel to practice on if we had our gear, but it can be bypassed with some slightly sketchy downclimbing. This is the return trip for most, so make sure you are comfortable climbing back out of this as well. Some webbing and someone with you is a great help sometimes as well. After a long walk through the wide and sandy main wash we made it to the S log! This is the start of the really good stuff, and the Ral-Stone is just beyond this point. You can downclimb this without webbing, but we had it and a good anchor was available so we made it easy. An alternate way down and up is to walk along the edge to the S-Log, my son was able to get down and back up this way without webbing. Handy Anchor to get to the S Log! The "Ral-Stone". This is the exact "stone" that dislodged and pinned Aron Ralston's Arm. It was sobering to think of spending 127 hours here in this position! The Ral-Stone is not far after the S-Log, and after this point the canyon gets increasingly deep and dark! At one point we could have used a flashlight it was so dark. It was hard to get any pictures until we got to the big drop. The big drop! This truly is an impressive sight after dropping through a dark tight slot. It's like the light at the end of a long dark tunnel. Amazing! 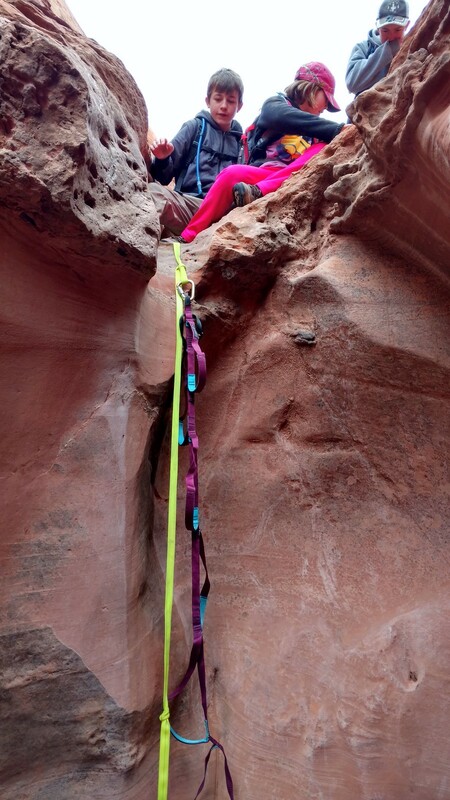 Some day we'd like to take our ropes and rappel this, then walk out of horseshoe canyon as Ralston did. 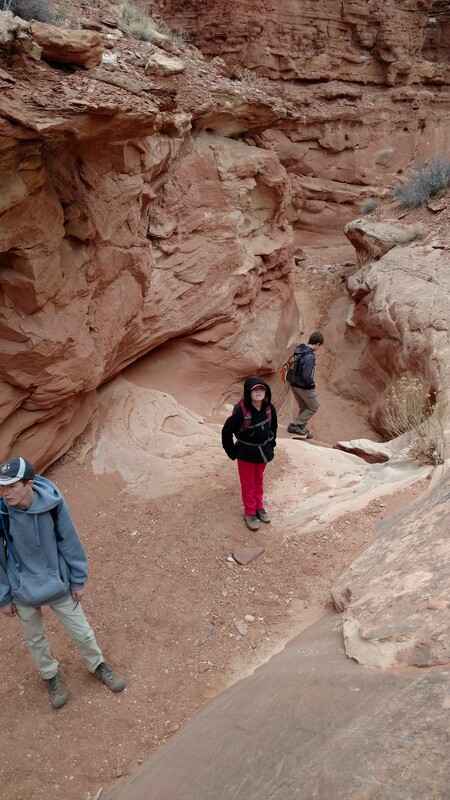 The rappel would be awesome, the walk out..long and sandy, but the great gallery and other pictograph sites are within this canyon so it's not all bad after all. 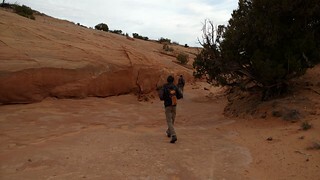 This was the end for us and the beginning of the return loop back to the truck.